Photograph. "672054.... watch your credit... International News Photo, slug (Brooks) -- Reds balk police by chaining girl to stump. 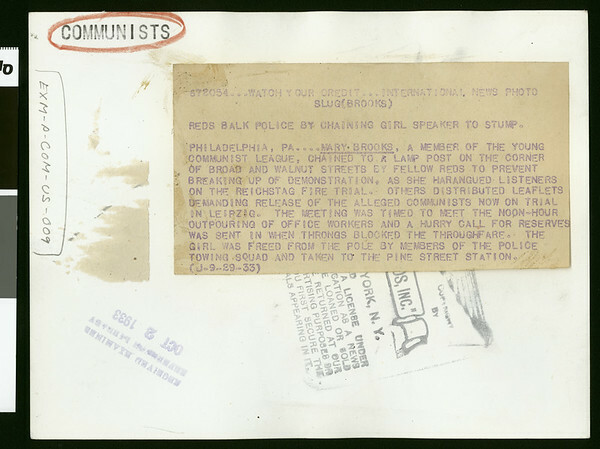 -- Philadelphia, Pa.... Mary Brooks, a member of the Young Communist League, chained to a lamp post on the corner of Broad and Walnut Streets by fellow reds to prevent breaking up of demonstration, as she harangued listeners on the Reichstag fire trial. Others distributed leaflets demanding release of the alleged communists now on trial in Leipzig. The meeting was timed to meet the noon-hour outpouring of office workers and a hurry call for Reserves was sent in when throngs blocked the thoroughfare. The girl was freed from the pole by members of the police towing squad and taken to the Pine Street Station. (J-9-29-33)" -- typed note attached to verso.